Here's my guide on how to follow up effectively once you've met someone (for example at an event). For your follow-up system to be effective you need to work out a few things in advance. The first thing is to get your mindset right for follow-up. When most people think of follow-up they think of chasing opportunities or trying to catch up with potential clients after a meeting to see if they're ready to progress. But we're going to be following up in a very different way. The key to effective follow-up is to make each interaction value-added. If the only time you follow-up with clients and prospects is to chase them, nag them or otherwise try to get something from them, then pretty soon they'll come to dread your calls and emails. They'll screen you out and try to avoid you. So rather than only ever following up to ask if a potential client is ready to look at an opportunity, progress with a proposal or any other form of nagging that runs the risk of annoying them, we're going to follow up in ways that they find useful. That way they actually look forward to hearing from you. They open your emails and take your calls. That means that with the vast majority of your follow-up communications you are going to be sending useful, valuable information to them. Or connecting them with people they'll find helpful, or inviting them to events they'll find useful, or sharing industry news. The second thing you need to prepare in advance is your prospect categorisation. By this I mean you need to be clear on who you want to follow up with and in what way. Typically that will be your highest potential clients. But it may also include potential business partners or referrers. Basically anyone you believe it's worth investing time in to build a relationship. Rather than just deciding on whether and how you should follow up as you meet people, it's best to define some objective criteria in advance. That way you don't end up being too biased by subjective factors such as liking them, and you don't end up procrastinating. You just check whether they meet your criteria and get quickly to action. Your criteria will be unique to you, but might include the size of the business (or wealth of an individual), their fit with your niche, geographic criteria, , the level of seniority of the contact, whether they regularly hire outside help, etc. My recommendation is to group the people you meet into different categories or levels of follow-up. 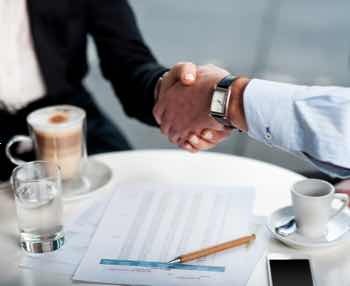 There will be some really high potential clients you'll want to follow up with frequently to make sure you're top of mind, and other less likely prospects that you might only want to keep in touch with infrequently just to keep the relationship alive on the off chance something might come of it. 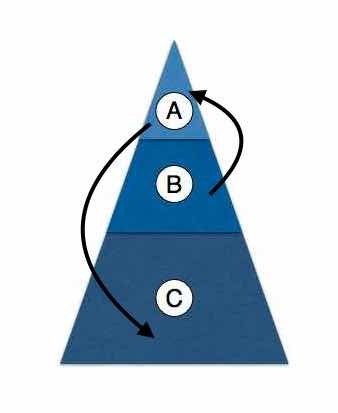 The simple system I use is to categorise prospects as A, B and C.
“A” category prospects would be your very highest potential clients or partners who meet all your key criteria and who you can envision doing a lot of business with. You might decide you want to follow up with them every 30 days, ideally. Depending on how much time you have available for marketing, and whether you typically work with a small number of high value clients or a larger number of lower value clients, you might typically have 8-12 prospects in this category at any given time. “B” category prospects would be a good fit, but not perfect. Or perhaps you believe they have significant potential but are a long way out from being ready to buy. You might decide to follow up with them every 90 days. And you might have 20-30 prospects in this category. “C” category prospects are those where you think there is some potential and you'd like to keep in touch, but they're unlikely to turn into your very best potential clients or refer a lot of business to you. However, since you never know with absolute certainty how things are going to work out, it's worth keeping in touch to some degree. With C category prospects you might follow up once a year. You can typically have very many prospects in this category, especially if you automate the follow up to some degree. Your mode of follow-up may also vary based on the category of prospect. With A category prospects your potential returns are very high, so you essentially do what it takes to build a strong relationship. You'll email, of course. But you might send them a book through the post, or invite them to meet for a chat over coffee. High investment, high return. With B category prospects you'll be emailing. Maybe using the post or phone. But your basic interactions won't be too high cost unless you spot a specific opportunity. With C category prospects you're basically keeping in touch, but without a lot of individual tailoring. So you might send them your regular email newsletter (with permission). Or the occasional piece via personal email. But until you see them engaging more or you note that they may be a better fit than you originally thought (and so move them into a higher category), you tend not to invest a lot in the relationship. Over time prospects may move between categories. After spending time nurturing a relationship with an A category prospect you may realise they're not as good a fit as you originally thought. Or a B category prospect that looked like they wouldn't be interested in working with you for a long time may accelerate their timeframe. The final preparation step is to decide on the tools you're going to use to run your system. This is dependent to a large degree on the nature of your business. If you tend to work only with a small number of very high potential clients then your whole system may only contain a few dozen A and B category prospects, and you can usually manage by recording their details in a spreadsheet, a very simple contact management system, or even just using good old fashioned pen and paper. If your business involved working with larger numbers of clients, you'll need more prospects in your system and you'll probably need some sort of Client Relationship Management (CRM) system to keep track of their details (for example, tracking the different people inside a potential client's organisation, noting their interests and issues, recording your communications with them, and planning next steps). My advice is to use as system that's as simple as possible, and does as much of the work for you as possible (such as linking with your email system and pulling contact details from there). More complex systems with lots of features might look attractive and as if those extra features could help, but usually more complexity means more difficult to use and you end up not using the system at all and so get no benefit from the advanced features. Here are some recommended systems to look at. They have similar core features for logging the details of your conacts and tracking your activity with them. Ultimately, it's often a matter of personal preference which one fits better with your own workflow so test a few out to see which works best for you. One other system to mention is Personal CRM – from followup.cc. This isn't really a CRM system as it doesn't track deals or pipelines. Instead, it's a simple tool that works inside Gmail to let you set follow up reminders which show up if you haven't been in touch with someone for a certain period of time. If your business is based around regularly following up with key cotacts rather than pursuing specific deals, it's probably a good choice for you. Follow-up really starts when you meet new people at events, conferences, networking groups or just casually or through introductions. If you're going to follow up effectively you need to know what kind of things your new prospects actually care about. Because, of course, those are the topics that if you follow-up on, they'll pay attention to. For example, if you're a business coach, you might find out that your prospect is interested in selling their business. Or that they're struggling to delegate and so don't have enough time to work on the strategy of their business. Or maybe they have customer service problems, etc. Knowing what their big goals, aspirations, problems and challenges are helps you know what would be a useful follow-up communication for them. You can also add in non-work related topics to the mix. Perhaps they're a huge fan of their local sports team. Or of opera, or a certain genre of fiction. All these give you more topics you can keep in contact with them about (provided you share that interest, of course). The business topics they care about are the core of your follow-up. But the non-work topics can built your relationship too. How do you find out what they care about? Effective networking isn't about you doing all the talking and telling people about you. It's about asking questions to find out more about your prospects so that you can follow-up effectively. Note: you don't want to make your questions too threatening. In a first meeting, most people will feel they don't know you well enough to tell you their deepest, darkest fears and problems in their business. So notice in the first question I ask them about the challenges they see in their industry generally, rather than in their specific business. That doesn't come across as threatening. But nine times out of ten, they'll answer by telling you about their own specific challenges – because those are the ones they know most about. In the other questions I ask them about their ambitions, or the interesting things they're working on. It's much less threatening to talk about an ambition or a goal than a problem. But if you do have a problem that's top of mind, often you'll mention your ambition or goal to solve it. So this kind of “phrasing on the upside” of questions can elicit responses about their problems if they want to reveal them, without it feeling like you're being too intrusive early on. And obviously, you don't launch straight into detailed questioning as the first thing you say to them. You generally talk about pleasantries first, about how they got to the event, anything they're hoping to get from it, their opinion of the speaker at the event, etc. If the discussion goes well, you can ask them for their business card, or offer to connect on Linkedin. This sets you up for the follow-up stage. You may also make a more specific offer depending on the conversation. So, for example, if you end up discussing a challenge or goal or problem they have that you have specific experience with, you might offer to chat to them about your experience over a coffee. Or if it sounds like your regular email newsletter might be valuable you can offer to set them up to get it. The key is to offer them something useful that matches with what they're looking for, and not to try to sell them anything. It's far too early in your relationship to offer to meet to talk about working together or to get to know them or their business. Asking for their business card or offering to connect on Linkedin is low commitment and low risk for new contacts, but gives you the opportunity to follow-up. The first follow-up you do after meeting someone is critical. It's a chance to make a great first impression and differentiate yourself from everyone else they've met. Most people won't follow up at all, so any form of follow-up puts you at an advantage. But we want to do better than that. You first step is to decide which category (A/B/C or whatever system you decide to use) your new contact should be in and to record their details in your system. Remember to capture any useful information which will enable you to follow-up in a value added way in the future. Then decide how you want to follow-up and with what content. In terms of content, at minimum for an A or B category prospects you'll want to contact them at least to say you enjoyed meeting them. A Linkedin connection request or an email can work well for that. If you gleaned from your conversation with them some topic that you have useful information on (for example an article you've written) then take the chance to attach it. You should also consider alternative ways of communicating. If you got on well, a phone call might be appropriate. You could also send them a “nice to meet you” card through the post. While this sounds a little corny, it will make you stand out and the truth is that the recipient of the card will be a little flattered as it takes a lot more effort to hand write and post something than it does to rattle off an email. A printed PDF version of an article with an attached hand-written “thought you might find this interesting” note works well too. All you really need to do is make sure your article is nicely formatted. Keep your description of the offer low-key and casual. Don't make it sound like a big deal but more an informal meeting between two new friends (which is basically what it is). If you try to “sell” the offer and tell them about all the wonderful things they'll learn in the meeting it will feel too much like you have an agenda to sell something to them and they'll feel uncomfortable with the idea. Your initial follow-up will get your relationship off to a good start. But, of course, building the credibility and trust needed before someone will be ready to hire you takes time and multiple contacts. That's where your ongoing follow-up comes in. They key is to make your follow-up activities a habit. Not just something you do when you feel like it or inspiration takes you, but something you do week in, week out. So schedule time in your calendar every week for follow-up. It needn't take long each week, but you must do it consistently. My recommendation is to pick a fixed time every week where you plan and do your follow-up. Personally I do it on a Monday morning alongside my weekly planning. Process-wise I recommend you get out your notes on each of your contacts and read through them, then spend a few moments quickly brainstorming what you can do to follow up with them in a way that adds value. Your knowledge of their big goals, aspirations, problems and challenges will tell you what they would find valuable. Or in the absence of specifics for an individual client you can use your knowledge of what your typical clients find valuable. I recommend that for your A category prospects and clients you do this every week. You won't be able to think of appropriate follow-up every week, so typically you'll end up following up monthly with each contact. Similarly with your B category contacts, if you review their details every month you'll end up following up roughly quarterly. Recommend a tool, service, piece of software, etc. The key to effective follow-up content is your understanding of what would be useful to your contacts. And that's based on your initial meeting and further interactions. So whenever you send them something or have further contact with them don't be afraid to ask more questions to find out more about what they care about and what you could use for follow up. Wherever you can, use follow-up content that not only addresses the goals, aspirations, problems and challenges of your potential clients but that also hits some of the “know and feel” factors you identified that they need to see before being ready to work with you. So rather than just sending a generic article on a topic of interest, use a case study of a client you worked with. Make sure the case study still gets across valuable information, but the very fact it's based on your work with clients rather than being based on theory means it will get across the impression that you get great results for your clients. When appropriate, link your follow-up message with an offer to take the relationship one step further, if they're ready. So if you send an article about a topic you think they might need help with then offer to meet to discuss it with them over coffee. Or ask for their feedback and if they show a lot of interest, offer to share some case studies via GotoMeeting or a hangout. That way you mover closer and closer to discussing working with them. Whenever you think of a new follow-up for a contact, note it down because you could re-use the exact same thing (article, invite to an event, etc.) with other similar contacts in future. Over time you can build up a database of effective follow-up items to use time and time again. You can even reach the stage where for a typical new prospect you cycle through largely the same sequence of follow-ups for each of them. You can also “stalk” your contacts and get alerted whenever something interesting happens to them. This can prompt a whole series of value-added follow-up. Set up Google Alerts to inform you whenever your contact, their business, their competitors or topics they're interested in get mentioned in the media. Use Newsle.com (now part of Linkedin) to update you whenever your Linkedin contacts get mentioned in the press. If your contacts are regular Twitter users (surprisingly many people in business are) add them to a private Twitter list so you can focus in and review only the updates from your key contacts and respond accordingly. Sometimes a simple retweet or comment is enough to keep you on their radar. Use Grapevine6 to suggest useful content to share based on your core topic areas. When you do use email to contact them, use the tracking built in to Contactually or an add-on tool like Mixmax so you know whether your emails have been opened and/or clicked. The tracking isn't 100% accurate, but it can be very helpful to know whether someone has read your previous emails when you're figuring out how to follow-up. The next and final step in follow-up is to convert the strong relationships you're building into paying clients. If you're building solid relationships with the right people, then at some point when they have an issue they need to address that they know you can help with they'll reach out to you for an initial discussion. But you can also prompt this process by taking opportunities to them. You need to do this in an appropriate way. If you come across as too aggressive or looking like you simply want to push sales at them then pretty soon you won't have much of a relationship. As ever, frame the question in terms of the value they'll get from the discussion with you. And give them the option to say yes or no. I find that generally, the best way to raise opportunities in a format that strengthens rather than diminishes your relationship is to offer a “High Value Briefing” on a topic. So if you spot a specific area that you think an A category prospect or client may need help with it can be worth preparing a specific value-added briefing for them on that topic. For example if you work in manufacturing and you notice they seem to be having a lot of problems with returns and complaints you might prepare a short presentation for them on best practices in quality control. For A category prospects with very high potential value you can afford to invest in a tailored briefing just for them and to offer it to them (I suggest you ask them if they'd be interested before you invest time in developing it). 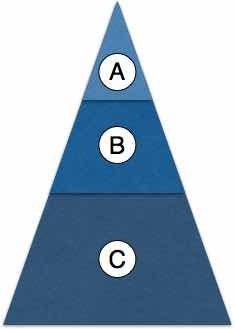 For B category prospects you'll probably develop one or more briefings you can use with multiple contacts. So they could be based round common themes you see in multiple contacts, or emerging trends in the sectors you serve, or simply some very interesting work you've done recently or perhaps a research project where you've invested in creating new content around a specific topic. Make the offer to your potential client to deliver the briefing you think would be the most useful to them. If you're in touch with their needs and challenges you should be able to identify an area they're genuinely interested in. But even if it turns out it's not a hot topic for them, you've not damaged your relationship in any way – you've simply offered them something of value for free that they don't happen to be interested in right now. They may come back to your offer later or they may take you up on a different offer you make in a few weeks or months' time if you spot something else of interest to them. The key with the High Value Briefing is to make it an interactive discussion where your potential clients share their challenges so you can talk about specifics, rather than it being a generic one-way presentation from you. For potential clients where it's not practical to meet face to face regularly you can offer a 1-1 webinar; or a group webinar for multiple prospects. In Momentum Club we have resources on winning new clients using strategy sessions, high value briefings and webinars (amongst a whole bunch of step-by-step guides covering pretty much every key aspect of marketing and sales). If you're not a member you can grab a 14 day trial for $1 here. There are two potential outcomes of a high value briefing: both good. In the best case, the topic you talk about is one they'd like to progress with and it leads directly to an opportunity together. In the worst case, you'll have provided helpful information to them and enhanced your relationship even if they decide not to progress with this specific opportunity right now. Your A/B/C categorisation won't remain static. 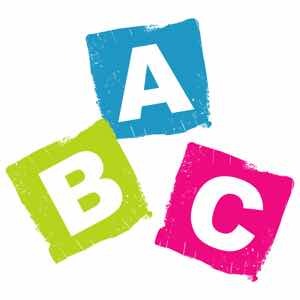 As you find out more about potential clients and contacts you may realise they're a better prospect than you originally thought and a B category contact may become an A. Or you might find out the reverse and relegate them to a lower category. Make sure you also update your “system” (whether you're doing your follow up manually or via a CRM system) with new information you discover about an individual client's goals, aspiration, problems and challenges, or anything that can help you make a connection and be helpful and interesting to them (e.g. birthdays, favourite sports teams, conversation topics). And make sure you're also expanding your relationships into other individuals within larger organisations. Your follow-up system should be dynamic: adjusting to changes in both your priorities and new information you find out from clients. But What Happens When You Really Do Need To Chase Someone? OK, so in the real world you do occasionally need to chase someone for something. Perhaps you met them and they agreed they'd call you for a further discussion, but didn't. Or you submitted a proposal they were supposed to have given you feedback on. Well, in those cases you have every right to just drop them a note to check up on progress. Frame it as a question rather than “hey, you haven't got back to me” of course. I normally ask if things are “still on track”. And I'm assuming you set up something firm during the previous interaction. Don't make the mistake of having a meeting but not agreeing the next steps and putting firm dates in the diary: it's so much harder to loop back and get something agreed later. And normally for things like reviewing proposals you'd try to agree a face-to-face or on-the-phone session with them where you go through it and co-create together, rather than just sending something to them for feedback. When you follow up to check on progress, use the medium that works best for them based on prior communications. But if you can, pick up the phone. Especially if you've previously met face to face or spoken on the phone. It's too easy to ignore an email when you're busy. Go back to our principle of adding value with each communication too. While you've every right to ask someone if they've been through the document you gave them when you met, how much better is it if instead of just nagging, you also sent them some more useful information? “Hi John, just emailing to check whether you had any feedback for me yet on those initial ideas for reconfiguring the project management system? By the way, I did a presentation last week on emerging best practices for fast-tracking projects – I've enclosed the slides as I thought you might find them useful”. Adding value in your chasing message completely changes the psychology. If you just nag, you can build resentment. And people simmering with resentment tend not to be in the mood to send you a status update. But if you add value you build gratitude and they feel guilty for not responding. They'll often send you a short update note with an apology. If you still don't hear back from them within a couple of days I tend to send one final chasing communication. A lot of people keep chasing again and again, but that just conditions the other person to expect you to keep chasing and they abrogate their responsibility to get back to you, knowing you'll keep calling. Instead, I send a message that basically says “looks like priorities have changed and this might no longer be something urgent for you, so I'm not going to keep nagging you about it and annoy you. If I'm wrong, do get back to me and we can discuss, but otherwise I'll ‘close the file' on this one”. Telling someone you're not going to be chasing them and the ball is firmly in their court often causes them to reach out to apologise. They now know they need to do something if they want this to happen, rather than relying on you to keep on contacting them (and so letting it slip further and further down their active priority list). And remember, it's not like you're never going to communicate with them again. If you've adopted the habits of good follow-up detailed in this article you should be in regular contact with anyone who's got potential. So even if this particular opportunity has dropped for now, you'll still be in their mind because of your ongoing value-added follow-up. That means that should the opportunity become live again, they'll immediately think of you, without you needing to keep chasing them about it. You'll have strengthened your relationship through your follow-up rather than have weakened it. Of course, your follow-up system is only as good as it's implementation. It's up to you to take the elements I've laid out for you and make them a reality in your business. Turn all these great ideas about following up into a habit. Something you do week-in, week-out without fail. For follow-up to work, it's got to become a habit. Something you do EVERY time. So what's your next step? 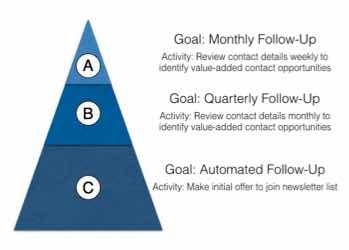 How are you going to implement YOUR follow up system?